When I was first learning Flamenco in the mid-60’s I was fortunate to meet Bernard Kreil (Nino Bernardo). Not only was he an excellent player but a great teacher. He also had another skill. Transcribing the music with correct rhythms and clear notation. He had a ton of Sabicas, Escudero and Ramon Montoya music that he had transcribed. It was pretty accurate. 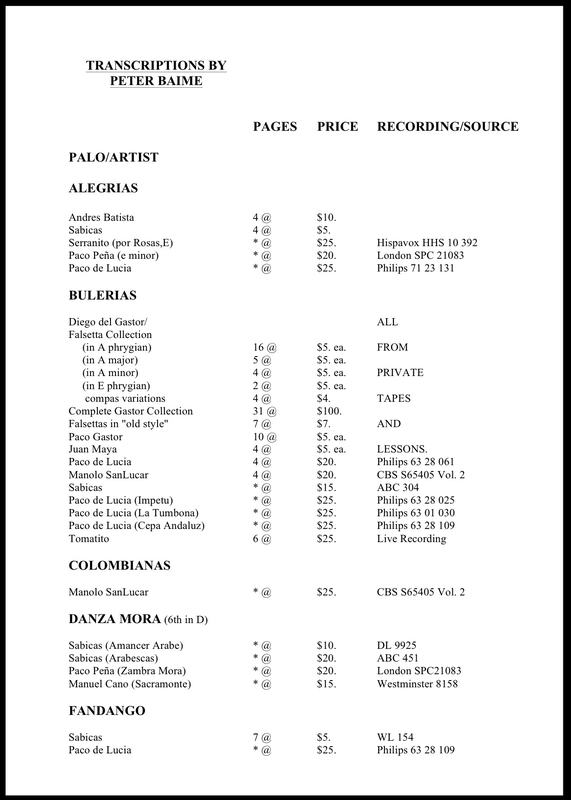 It was more accurate than much of the published Flamenco music was to be for the next 35 years. I didn’t know it then but he was in an elite group of but a handful of transcribers internationally. Over the next 9 months I learned from him by example and by the 1970’s, I was busy at transcribing in another golden era. By the 1980’s I was shipping my transcriptions around the globe. I knew at that time it was a business that was in for a change, and change it did. It wasn’t long than photocopies of it were everywhere. Handwritten transcriptions were giving way to notation software. It took years for this notation software to replicate the intricacies of flamenco music and in 2016 it's looking very good. Then, as the Internet rapidly expanded and file sharing was a click away, it really became more of a labor of love. It wasn’t long before many of my handwritten transcriptions ended up in typeset notation published in well-known books from Japan, Europe and the US. Players in Spain went from criticizing the activity and believing it couldn’t be written to embracing the skill and profits. At that point I stopped advertising them but I continued to transcribe for my own interests and for students. Now I probably have 5,000 transcribed and original falsetas written out. I largely stopped writing out complete pieces, as it just wasn’t as interesting to me as it used to be, and began just writing out the falsetas that I liked best. I still need to point out the many errors in published books of transcriptions that students bring to me. Flamenco still remains largely a music grown out of expermentation, improvisation and learned by rote. I wanted to capture and document this history as it happened.